Vaughn’s life is still on the line and while he thought Lucifer was his main enemy, there may be other more dangerous foes lurking in the shadows for their turn to strike! New book coming on September 12th…LEGIONSWORN. Get your copy for 99c! We’re celebrating the upcoming release of LegionSworn, book 3 in the LegionBorn series. Fallen angels, supernatural creatures, jollof rice and a young guy who discovers Lucifer wants him dead. Delve into Vaughn’s world in LegionBorn. I’ve been interviewed for other things and I’ve had to do interviews myself but it’s always loads of fun to do author interviews. You get these questions that seem simple on first read and then you have to think deeply to answer them adequately. You also end up leaving some truths about yourself in the open. That’s the scary part as I would much rather be an anonymous hermit cranking out books than someone you know. I’m learning I will have to change on that point–way of the times and whatnot, but don’t let me get off track. Go read the interview little old me did at https://jackydahlhaus.com/blogging/meet-the-author-f-f-john/. Today’s freebies come to you by way of C. C. Ekeke’s Star Brigade. Humankind is under siege. Time to send in Star Brigade. Following a deadly ambush, Captain Nwosu is tasked with resurrecting a once elite unit of covert supersoldiers. He must now rally an unlikely, untested band of brothers to protect Union Space–and humankind’s survival–from galactic empire upheaval. If he can’t, they’re all as good as dead. 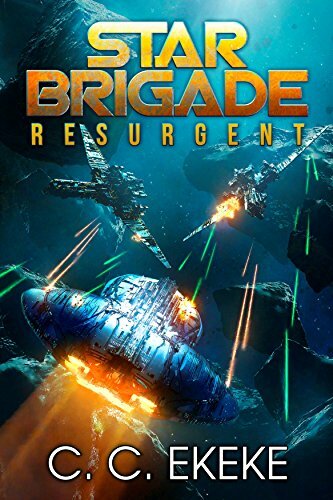 Star Brigade: Resurgent is filled with wonderfully complex layers of character drama and space soldiering, political conflict and rich world-building. The intensity of Arthur C. Clarke with an expanded universe found in the likes of Mass Effect. Get lost in the kind of immersive space opera you love to read today. Only 99c until June 6th, 2018! Get your copy now! Talking business over steak and glasses of bourbon should be straightforward, right? Well, maybe not always but it should be when the client’s one you’re familiar with. My strategy has always been to stroke the client’s ego (those are always bigger than you could imagine), tout my wins then go for the kill—tell him how my law firm can advance his interests. This meeting with Terry Andrews, the CEO of an insurance conglomerate, should have been smooth sailing. Instead, from my seat by the curved, floor-to-ceiling conservatory windows, I was distracted by three men who made the hairs at the back of my neck stand. Monsters in human skin, they sat casually amid the draped tables, the crystal light fixtures, and the brick walls with paintings of cattle ranches and cowboys. LegionBorn is the first book in the LegionBorn series. If you like action-packed urban fantasy where fallen angels, nephilim, and witches face off with nasty netherworld creatures, buy this book today. Buy or Borrow at Amazon for only 99c today and tomorrow! I’m currently reading an urban fantasy tale. It’s all part of developing a stronger understanding of the expected Tropes in that genre so I can write stronger stories. Anyway, the book is super fast-paced. WOW! As in if a story is supposed to have peaks and valleys, this one is all peaks. There’s very little time to breathe. I know authors are told to pace their stories and the action in their stories but something tells me breakneck tales are beloved by a large number of readers. I was in cave mode last week and neglected to put up a list of freebies. For that reason, this week’s freebie list is twice as long! Here’s hoping you find something of interest and enjoy some good reads. That being said, FFJ’s Freebies are brought to you by The Paragon, Book 3 of The Nome Chronicles series. Available for sale on Amazon and free for Kindle Unlimited users. When love turns to hate, is there a way back? Since her father’s death and the subsequent betrayal, Neith trusts no one. She has learned to be ruthless and will do whatever it takes to defeat anyone in her way. Having once loved Invier only adds to her determination to crush him. Invier can’t believe the girl he sacrificed so much for wants him dead, and he’s desperate to convince Neith he’s not her enemy. But her threat is not his only concern, nor is she the only one he needs to save. In the end, finding a solution might require him to resort to the very tool he hates—violence—and, he may need to kill the one he loves. Invier and Neith’s struggles will bring them head to head in a final and deadly showdown as The Nome Chronicles come to a thrilling conclusion in THE PARAGON. Read on for this week’s jumbo sized FFJ’s Freebies! As a writer, there is no end to the stories I have in my head. The main hindrance to those stories coming to be is time. There just isn’t enough of it. Oh, and money. There’s never enough of that either. And if I’m to be honest, money becomes the most important factor when I consider how deep a series will go, sadly. You see, if the book isn’t pulling it’s weight then that’s an indicator that the book doesn’t have an audience and thus doesn’t deserve to go on and on and on.